GRILL DIRECTIONS: Heat grill. Spread cut sides of hoagie bun halves with salad dressing. If necessary, cut cheese and ham to fit hoagie. Top bottom halves of buns with cheese, ham, bell pepper, tomato and top halves of buns. Wrap each sandwich in heavy-duty foil. When ready to grill, place wrapped sandwiches on gas grill over medium heat or on charcoal grill 4 to 6 inches from medium coals; cover grill. Cook 5 to 7 minutes or until cheese is melted and sandwiches are warm, turning once. To heat in oven, place foil-wrapped sandwiches on cookie sheet. Bake at 350°F. for 10 minutes. Use your favorite deli meats and cheeses in these hot submarine sandwiches. You can omit the ham and American cheese, or simply build a larger sub. Sandwiches with additional layers need a few more minutes to heat. 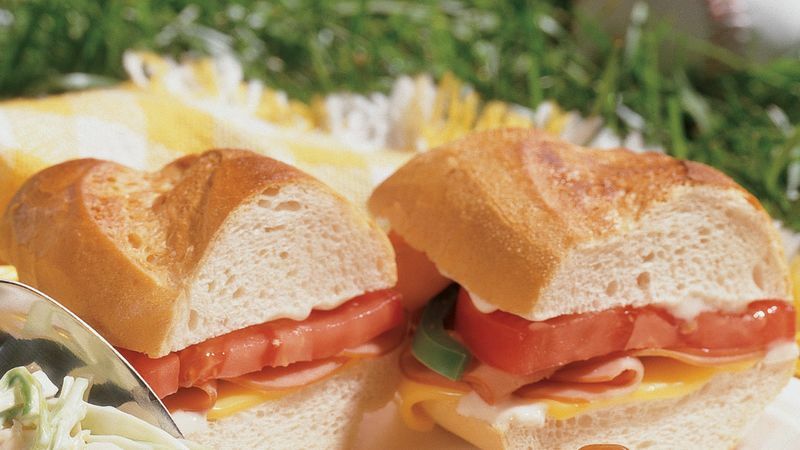 This hot sub recipe leaves you plenty of time to relax with the rest of the picnickers. Assemble the sandwiches ahead and wrap them in foil. At the picnic site, fire up the grill and put the beans on. Then play ball, swim or enjoy a god book. Just before pulling out the plates and utensils, put the sandwiches on the grill and it’ll be time to eat in less than 10 minutes.